From Jablonec you take direction to the village Bedřichov. There at crossroad, witch is above the sewage plant, you turn right in directon to village Josefův Důl. Past 2,5 km you will arrive to the village chapel, where you turn right and then after 200 m you turn right again on crossroad next to pension “Heidi”. Then you contunue passing by pension “Dřevona” until you arrived to he pension Artur. 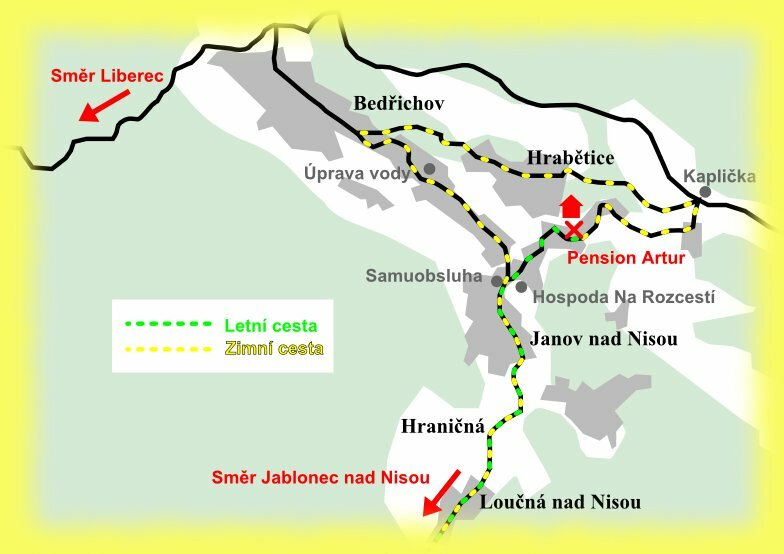 From Jablonec you take direction to the village Janov nad Nisou. There is a self-service shop about 200 m behind the church on the left side and tavern “Na Rozcestí” on the right side. Behind the tavern you turn right and you will continue about 1 km up the hill, along the pension “Metra” and “První nelyžujem” until you arrived the pension Artur.